One of the thousands of things we learned at Content Marketing World is that people still want (or you could even say need) in-person events. The event itself took the efforts of 100 people, from the staff to speakers to the event team and sponsors. The response from so many of you on the success of the event has been overwhelming and has prompted many questions on how we managed to put it all together. One specific question that kept coming up was, “How did you get the word out there?” Well, I can tell you, a great deal of our success can be attributed to the content produced on the Content Marketing Institute, as well as on Joe Pulizzi’s blog, CCO magazine, and on our social media platforms. But the biggest asset we had was recognizing how important it was to leverage our relationships. What does that mean, really? You need to ask! You may see this a lot on Facebook — a friend asking if any of their friends has something they need, knows some key information or, most importantly, has experience with something they are looking to do. People trust the answers that come from their friends. Can this be applied to business? Certainly, but only if you are ready to take advantage of it. There are a lot of people producing a lot of content. Over 11 billion web pages currently exist with thousands of new pages of content being created every day. What is as important as producing quality content relevant to your audience is that you engage with your audience to ensure they understand the fundamentals of what you are sharing and want to learn more from you, the expert. There is no better way for people to get to know you and that you are an expert than by commenting on their content. Tell them what you like, what you don’t like, what you learned, what you agree with (or disagree with). Or, you can ask a follow-up question. The choices are endless. If someone takes the time to comment on your blog, show them your appreciation by thanking them, answering their questions, or sharing an additional insight. So many opportunities exist to build and extend your relationships with fans and followers, so try to take advantage of any opportunity to make an additional connection. Members of our team personally reached out to each of their LinkedIn contacts and asked them if they were attending the event. When someone replied for more information it was sent to them or when they replied no, we asked why. Every response gave valuable information for our planning. We personally direct messaged (not auto replied) any new followers on Twitter to see if they were planning to attend. As with LinkedIn, any time a follower replied with an answer or a question a follow up direct message was sent. We leveraged the networks we already had. Many of our contacts have asked us to promote their great events, which we are always eager to do. In exchange, we asked if they would be willing to help us promote our event. We gave each of these partners a unique coupon code for registration to use with their audience so we could track which of these were most beneficial for us. Want more ideas? Here are 42 ways you can use content to connect with your audience. If you have a great idea, need a question answered, need some advice… whatever it is, ask. You may never find the answer otherwise, and people like to feel like they are being helpful or influential. If you want to host an event, that’s great. For us, the experience of Content Marketing World validated our hopes that our audience wanted to be there. But it’s important to attend events too, and make sure you participate not only in the sessions but also in the networking events. These are priceless opportunities to ask your questions, learn something new, and meet really cool people. 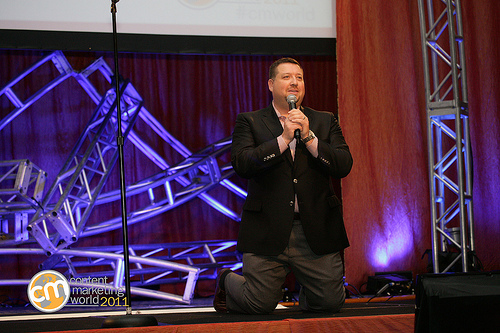 At Content Marketing World, Jim Kukral got on his knees to ask the audience to produce exciting content. I would like to do the same. I ask you to continue to build amazing relationships, but make sure you leverage those relationships in as many ways as you can. Just look what it has done for us! Pam Kozelka is the VP of operations for the Content Marketing Institute. She has been with the company since its inception and is excited to see the growth in the industry that has occurred in such a short period of time. She is often heard telling people she has the best job in the world because of the amazing team @CMIContent and #CMWorld. You can follow her on twitter @PamKozelka.